The Incredibles certainly made an impression on me as a kid. As a child who grew up loving comic books and superheroes, The Incredibles came out at the perfect time. It's such a fun movie, but it also has a lot of deep and mature themes that I didn't come to fully understand nor appreciate until later in life. In many ways, it was a commentary on a genre of filmmaking that hadn't yet hit its prominence. 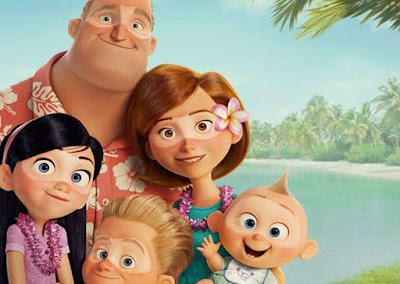 But now we are entirely inundated with comic book movies, and, with the current climate, now actually becomes the best time to make an Incredibles 2. I would have preferred the sequel had taken place in real time, with it jumping fourteen years in the future, and with the kids all grown up and the parents significantly older. But Brad Bird decided it was best for the movie to pick up right where the original left off (literally), and I trust his judgment. More than anything else, I'm just excited to finally go back to this world. It is so ripe for new material and new movies, and it's great that we get to revisit it. And now we have a new trailer for Incredibles 2, which opens in theaters on June 15. I really liked this trailer! It more or less expanded on the previous teaser trailer, building upon the storyline it introduced of Helen (Holly Hunter) going off on her own mission while Bob (Craig T. Nelson) has to take care of the kids. We get a better understanding of Bob Odenkirk's role in the film, as well as our first look at the movie's villain, the Screen Slaver. There were, however, a few instances where it did feel like they were simply pandering to fans of the original. There were a couple jokes repeated from the first one, such as Frozone (Samuel L. Jackson) going for his super suit, that felt like they were only in there to hearken back to the original. I don't think this will be the case, but I just hope that the movie doesn't simply try to emulate the first one. While I do want it to feel familiar, I want Incredibles 2 to be its own movie, with its own themes and jokes. I don't want a rehash of The Incredibles. Again, I don't think that will be the case, but this trailer did highlight that aspect of the film. It might make sense for marketing purposes, but if it pertains to the film in its entirety, it would sink the movie. Overall, I'm really looking forward to Incredibles 2. I don't think it will be as good as the original, but I do think it will be one of the better Pixar sequels, something they have struggled with in the past. I just want to see it at this point! What do you think? Did you like the second trailer for Incredibles 2? Are you planning on seeing the film? Leave your thoughts in the comments section below.